We GUARANTEE you won't find the same horse riding holiday at a lower price through any other source... and if you do, we promise to refund the difference! Suitable for all levels or riders and non riders. Suitable for children. Rates are quoted per person sharing, 7 nights. Prices are based on staying in the Salsa rooms which are spacious with either one king or two queen beds. Please ask us for a quote for suite rooms including suites with private jacuzzis. Children under 3 years old go free and discounts apply for children sharing room with parents, please check at time of enquiry. Any stays over 4 nights, include a “Free Tucson Airport Transfer”. The above rates include the state tax of 13.5%, there are no hidden costs. 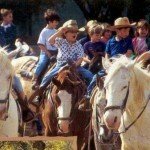 Includes – All the riding, accommodation, meals, outdoor BBQ’s, drinks and ranch activities; riding, breakfast rides, team penning, arena games, guided mountain bike adventures, guided hikes, fishing, tennis, volleyball, indoor and outdoor pools, nature activities, children’s program & evening entertainment. Pick up at Tucson airport is complimentary for stays over 4 nights otherwise the charge is $110 return. If arriving into Pheonix – we can arrange a transfer on application or you may want to self drive. Flight to Tucson which is nearest airport but you can also fly to Phoenix. Note: Rates are subject to daily exchange rate fluctuations, please refer to our Terms & Conditions for full details. All our horse riding holidays hold a price guarantee. We believe in your piece of mind on price when you book one of our horse riding holidays and will refund the difference should you find the same horse riding holiday elsewhere at a lower price. 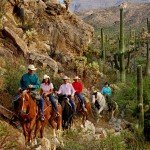 Tanque Verde is a perfect horse riding holiday in the USA if you have always dreamed of being a cowboy or cowgirl, but like your comforts and have mixed abilities in your group. This place offers a large and slick operation, with 74 rooms and a great reputation for its food and service. During school holidays, it’s perfect for families and there are special children riding programmes. In fact, Tanque Verde has won notable awards including ‘Conde Naste Award of Excellence’ for the best ranch. 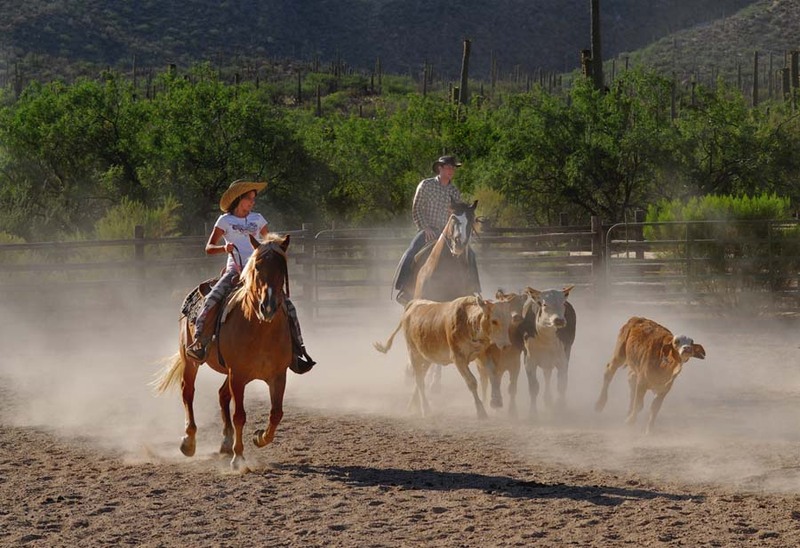 The ranch itself is located on 640 beautiful acres east of Tucson, Arizona and adjacent to the Saguaro National Park and the Coronado National Forest and offers guests horse riding, tennis, guided hiking, mountain biking, nature walks and much more as part of an all-inclusive rate. 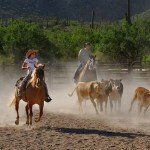 This historic dude ranch, founded in 1868, offers the very best of a south western resort plus an authentic, Arizona dude ranch experience. The dining and accommodation at Tanque Verde are all part of the experience and the ranch is famous for its fine restaurant dining and delicious food. Added to that for the authentic Old West feel, they also offer weekly, evening, outdoor barbecues, with live Western entertainment, and breakfast rides up to the Old Homestead for an early morning, cowboy breakfast out in the open. 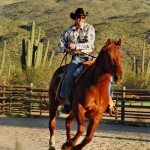 Tanque Verde Horses – Quarter Horses, Draft horses, Thoroughbreds, Arabians, Appaloosas, Paints, and Mustangs. Level of Riding & Pace – Beginner to Intermediate. Weight Restriction – 18 stone / 114 kg / 251 lbs. Group Size – Maximum 12. 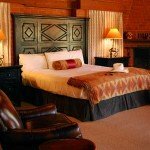 Tanque Verde is a luxury ranch, hotel style which boasts 74 South-Western-style rooms and suites, fully air- conditioned and offering beautiful desert and mountain views in a beautiful, secluded natural setting. 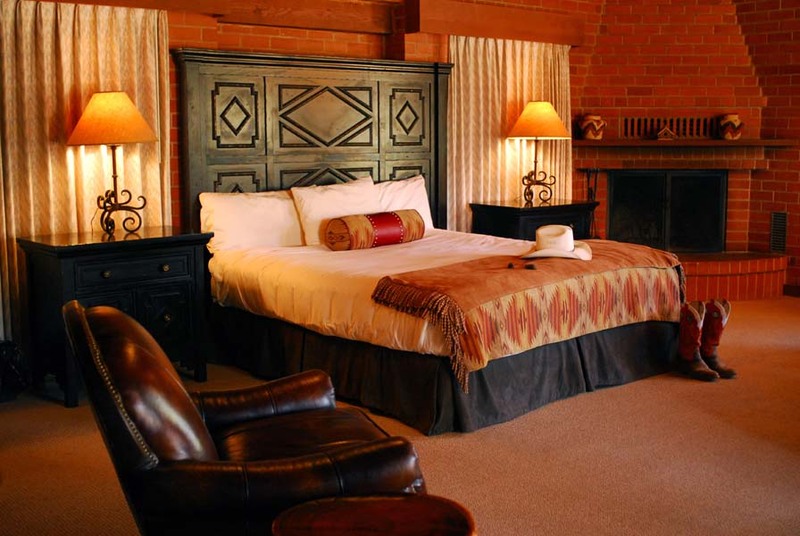 The lodges are decorated with original South-Western artwork and antiques and have fireplaces and patios. The food at Tanque Verde is a mix of American and continental style, with three choices at every course and a buffet with an enormous salad bar. All the meals are served in the main dining room, overlooking the outdoor pool and waterfall, with a majestic view of the Rincon Mountains. You can even enjoy pre dinner drinks at the local ‘Doghouse Saloon’. In addition to the riding at Tanque Verde, they also have an indoor and outdoor pool, jacuzzi and sauna and on-site spa. We have travelled the world testing a huge variety of horse riding holidays to make sure we offer you, our client, the best horse riding holiday experience possible. Our horse riding holidays are thoroughly researched – we consider all the elements that go towards making our horse riding holidays collection the best in the world. We check the quality of the horses, if they are fit for the job, well produced and looked after. We make sure the riding terrain is good going, the countryside is interesting and, for example, on Classic Dressage horse riding holidays, the arenas are in good condition. We make sure the accommodation, whether it’s a five star hotel, a farmhouse or camping, is clean and comfortable, and offers a great night’s sleep. The food is all important too – we take the time to make sure we tell you if it’s cordon bleu, home cooked, or regional and locally sourced – above all it has to be delicious, plentiful and nourishing. Last but not least, we choose the horse riding holidays that have the best hosts, who are friendly, warm and welcoming. It’s only when all these elements come together that we add a horse riding holiday into our hand-picked collection of horse riding holidays. 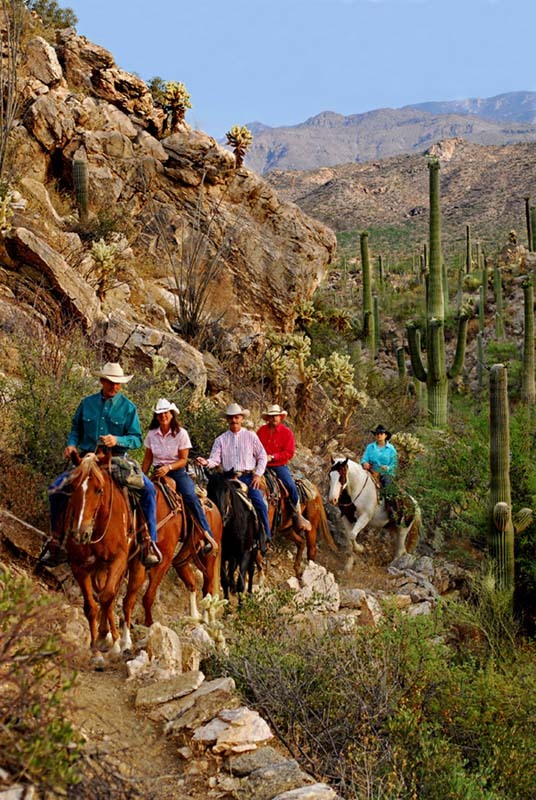 Horse Riding Holidays at Tanque Verde are part of Zara’s Planet Horse Riding Holidays USA collection. The itinerary at Tanque Verde is full of options and you can tailor-make from the activities on tap, or choose to book into the spa or just chill by the pool. 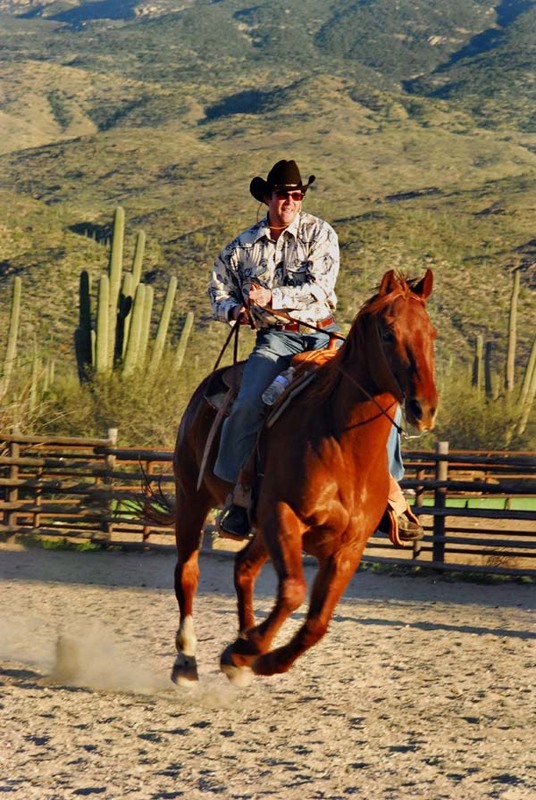 Tanque Verde Ranch has miles of scenic horse riding, hiking and mountain biking trails which offer ranch guests the opportunity to explore the unforgettable Sonoran Desert of the Old West. Horseback riding is offered every day of the week, both walking rides for beginners and cantering (loping) rides for more experienced riders. 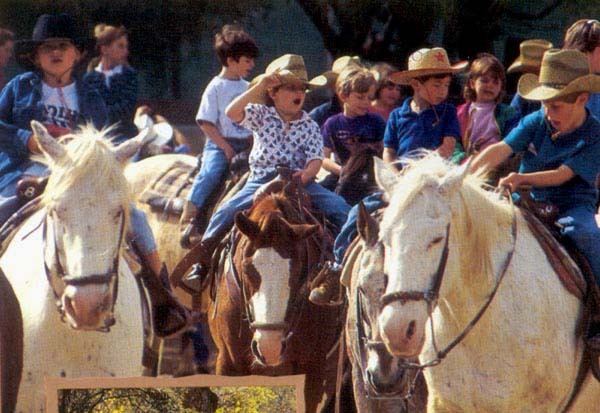 The fully-supervised children's programme provides a fantastic ranch experience for kids ages 4 through 11 years of age. The programme is very active, incorporating horseback riding, tennis, swimming, and hiking and educational, nature programmes, games, arts and crafts and other activities for a holiday experience that will never be forgotten! The ranch has 5 tennis courts and a staff tennis pro (October to April). Open most days, allows you the close up view of some of the less approachable desert fauna such as spiders, snakes, and rather large, ghoulish looking beetles. The Sonoran Desert is one of the world's most vibrant deserts. Catch and release fishing offers guests a relaxing close-to-nature activity at the 1.5 acre lake. Bluegill sunfish, largemouth bass, and channel catfish provide plenty of action and sport, in a beautiful setting, for both experienced anglers and novice anglers. If you are having trouble finding exactly the right horse riding holiday for you from our horse riding holidays collection, please contact us directly using the form below and tell us in your own words what you would like to do and we will use our extensive knowledge to make sure we find that perfect horse riding holiday. Please use the message box below to provide additional and any other relevant information like your riding experience and for how many people. Also, if the above Holiday describes few different options for your Horse Riding Holiday in the area - please add a note on which choice you are referring to. Thank you. At Zara's Planet we promise to give you value for money as well as an excellent personal service. We guarantee you won't find the same holiday at a lower price through any other agency or direct with the supplier... and if you do, we promise to refund the difference! Subscribe to our newsletter and receive our best offers every month!